The pulp stories of the Roaring Twenties and the Thrilling Thirties idealized a violent chapter in world history. The end of the Great War marked the start of Prohibition's gang wars, followed closely by the tough times of the Great Depression and the Dust Bowl, and then by social and political turmoil on the eve of WWII. This was an age of guns – a time when an increasingly mechanized world forced firearms to evolve rapidly in response to new fears, attitudes, and tactics. 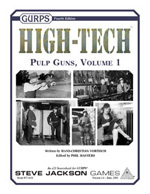 The Pulp Guns series looks at the shooting irons of this violent era, greatly expanding on the period offerings found in GURPS High-Tech. It gives descriptions, anecdotes, and stats for just about every gun made famous – or notorious – by the cops, gangsters, and mercenaries of this dangerous time, both in the real world and in the larger-than-life world of the pulps. Whether you're playing a G-man, a hard-boiled gumshoe, a tough dame, or a two-fisted soldier of fortune . . . whether your foes are gangsters, dangerous foreign agents, or supernatural Things torn from a Lovecraft story . . . you won't want to be without the best firepower that the 1920s and 30s have to offer! 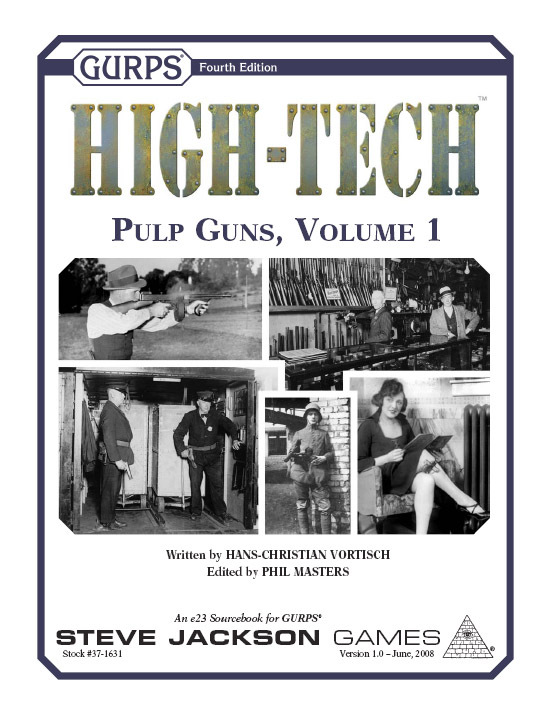 GURPS High-Tech: Adventure Guns – A catalog of weapons from just before this supplement, covering mid-19th through early 20th-century firepower! GURPS Cliffhangers – Adventure on the crumbling brink of disaster, dodging the jaws of death with barely a pause for breath between perils. This is the world of the dauntless men and daring women of 1920s and 1930s adventure tales.